These Coil Hand Crimpers / Spiral Coil Crimping Pliers are specially designed to help you to finish your coil bound books. In a single motion, the Coil Crimping Pliers both cut and crimp the coil bending a small piece of coil over to prevent the coil from spinning off the book. Coil crimpers are extremely easy to use and are essential for coil binding. Coil hand crimpers are specially designed to cut and crimp plastic coil in one easy step! Additional sets of hand crimpers can speed up productivity! Cuts and crimps coil sizes from 6mm to 50mm. Recommended for use with coil inserters that do not have automatic crimping. Red dot facing upward indicates the proper position for crimping. Longer crimp length prevents coil from unwinding out of book. I like the crimping pliers, but wish they would have come with instructions and tips on how to use them and get good results. A magnificent piece of hardware which accomplishes its task with ease and leaves no scratching points or edges. These are better than the ones I previously had from GBC. These have a slightly thicker rubber handle which makes it easier on my carpal tunnel syndrome. This was a replacement crimper. We misplaced the first one, which has lasted nearly forever! Welcome to MyBinding's How To videos. Today we answer the question how to use coil crimping pliers. First, you want to make sure the coil is threaded all the way through all the holes and hangs out on both ends. Then turn the entire project around so the bind faces you. Hold it in your hand and take the coil crimping pliers. Be sure that the little red dot on the head of the crimper is facing up. Insert the coil crimping pliers into just after the last hole all the way in, squeeze it good with one fluid motion. You'll notice that both the cut and the crimp are done nicely. For the best look, spin the coil back toward the hole and then flip the entire project over to crimp the other side. Once again, place the pliers just beyond the last hole and crimp. And now you have a beautiful bound book with a coil bind. And that's how to use coil crimping pliers. For more articles, demos, reviews, and how-to's on all things binding, check out MyBinding.com. Welcome to MyBinding Video. 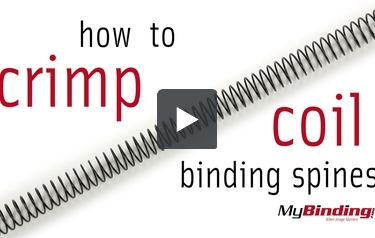 This is how to crimp coil binding spines. There are three simple rules to help you perfectly crimp your coil. 1. Coil Towards You 2. Crimpers Dot Up 3. Crimp, Flip, Crimp. Lie your newly bound booklet on a flat surface, and turn it so the coil spine is closest to you. The crimpers can be used in either your right or left hand, just hold them flat to the table, with the indicator dot facing upward. Pick the loop just after the furthest right hole punch, fit the crimpers around the loop, then squeeze the handles with a strong, smooth motion all the way through. Flip the booklet over, keeping the coil closest to you, pick the loop just after the furthest right hole punch and crimp it just like before. Your ends will be trimmed to an appropriate size and have notches to prevent the coil from twisting off the booklet. For more how to videos and all your binding needs, visit MyBinding.com. Spiral coil crimping pliers are used to finish binding documents with spiral coil. They cut off the excess coil and bend the ends over in a single motion, helping to ensure that the spirals don’t spin back off the book. Usually, spiral coils are purchased longer than the edge of the document you are binding. Most spiral coils are purchased in lengths that are approximately 1″ longer than your finished binding edge, allowing for the crimping process. Special crimping pliers makes the finishing process much easier, preventing you from having cut off the coil and then manually bend the end over so that it will stay secure. These pliers are marked with a red dot on one side, helping you align the pliers during the crimping process. It is also important to note that the red dot should always face the ceiling, and keep the spine of the book facing toward you when you are crimping coil. Spiral Coil And Crimpers also offer a standard throw length, or length of the piece of coil that is bent over, which is ideal for 4:1 pitch and 5:1 pitch coil – the two most common sizes. In addition, the plastic coated handles of these pliers make them easy to hold and easy to use. Although the throw length of the pliers is ideal for standard 4:1 pitch and 5:1 pitch binding., trying to bind documents with 4:1 pitch oversize oval holes, 3:1 pitch holes or 2.5:1 pitch holes will be difficult. With larger holes the throw length may not be long enough. This could allow the spiral coil to spin off the book. For these applications, premium oversize oval hole crimping pliers are suggested. The pliers must be squeezed hard enough to bend the end of the coil over but not so hard that you cut the end off. This can take a bit of finesse, and those who work with high volumes sometimes find the coil crimping process tedious and labor intensive. In this case, there are several automated crimping tools available on the market, but they can range in price from a few thousand to tens of thousands of dollars and often require significant amounts of setup time. Some new coil binding machines now include a small crimping tool on the machine itself and are easy to use, but are also very expensive. They may be a good alternative, however, for those who dislike crimping documents with these pliers. Anyone who uses a coil binder should have a pair of coil crimping pliers, so if your machine doesn’t’ come with a pair, it is highly-recommended that you include one in your order. 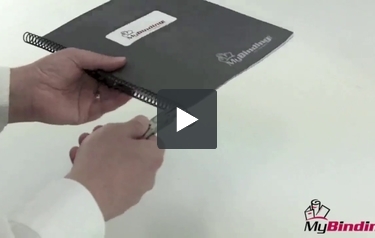 Although high-volume users may consider other crimping options, it is best to consult with a document finishing specialist before deciding which option will work best for your application. And don’t forget – customers who use non standard pitches or oversize oval hole pattern should consider a pair of pliers with a longer throw for the best effect. Are this crimpers recommended if I'm getting the Minicoil manual coil punch with the oval holes or do I need the more expensive pliers for this, most of my binding with not be more than 150 pg's. Thank you for your question. The Coil Hand Crimpers / Crimping Pliers would be a good option, they will work with any of the standard plastic spiral coil. 1st - What is a lower cost metal coil cutting / crimping tool? 2nd - Do they make a low cost metal / plastic (Does both) coil cutting / crimping tool? Asked by from: Rob C.
Thank you for your questions. The "Coil Hand Crimpers / Crimping Pliers" are the least expensive pair of crimping pliers that we carry. They are designed to work with the standard plastic binding coils. Currently we do no carry a pair of crimping pliers that are designed to work with a metal coil. Is it possible to get the crimper in a left-handed model? Thank you for your question. Unfortunately there are no Left handed crimpers available. Will the Coil Hand Crimpers / Crimping Pliers cut/crimp metal coils? or Do they only work on plastic coils? Thank you for your question. The Coil Hand Crimpers are designed to be used with just plastic coils, the would not work on metal coils. Do I need the roller thing to insert the coils onto the books? Here. You can insert the spines on the edge of your book by hand spinning them on a little bit at a time. If you just have a few books to do that will work just fine. However, if you are binding on a regular basis you will probably want to spend the extra $30 and get the unit with the inserter. This machine doesn't have an electric roller on the top and thus is less expensive. However we do have this exact machine with the roller included Here. You can insert the spines on the edge of your book by hand spinning them on a little bit at a time. If you just have a few books to do that will work just fine. However, if you are binding on a regular basis you will probably want to spend the extra $30 and get the unit with the inserter.